All-inclusive feature offering, which means you do not pay for any optional features. Just choose how many phones you want. Cloud Burst supports up to 25 phones / extension. Every phone to be on a call at the same time and still receive more calls. Your customers will always have complete access to your business. Most hosted cloud-based phone system providers charge you for a phone line for every phone in your office! This is definitely “phone line overkill” and adds needless cost to your business. XBLUE’s Cloud Burst removes this unnecessary expense as you pay just one low monthly fee no matter how many phones you have. Also, XBLUE’s Cloud Burst monthly service fee is one all-inclusive price, so say goodbye to cloud phone service providers’ hidden fees that can add as much as 40% to your monthly phone bill. So stop paying per user phone charges and save up to 50% on the cost of your phone system with an XBLUE’s Cloud Burst phone system. Cloud Burst replaces your telephone company phone lines and office phones with an advanced communications system that includes Automated Attendant, Voice Mail with individual boxes for every user, Call Announce Intercom / Paging, Conferencing and integrated Cell Phone system extensions. Cloud Burst telephone service and office phones are fully supported by XBLUE’s professional technical support team. Our experts will streamline the setup process and on-going operation of your office. Every Cloud Burst Phone System includes popular business features like Automated Attendant, Voice Mail with individual boxes for every user, Call Announce Intercom / Paging, Conferencing & fully integrated Cell Phone system extensions. In addition, a full suite of advanced features are included to enhance business efficiency and productivity. Voicemail message delivery to Email, Call Queues / Call Center functions, Detailed Call / Usage Reporting and Call Recording are among the advanced capabilities included with every Cloud Burst Phone System. There are no additional fees required to turn on advanced features. Cloud Burst phone systems can be located off-site at home or remote offices and operate exactly the same as system phones located at the main office. The remote user can access lines, make intercom calls and use systems features in exactly the same manner as users at the main office. access to individual system users. Even access to Conference Calls is simplified by enabling callers to select Conference Call Rooms. For customer service improvement and security, audio recordings of calls may be captured and saved. A system administrator may set up recording for all calls, or each system user may record calls on a per call basis. Recordings are stored on an optional memory card or in a data network folder. Incoming and outgoing call details are captured enabling custom system usage reports to be generated and exported by a system administrator. Details like call date, duration, line used, number called and Caller ID data are all available. 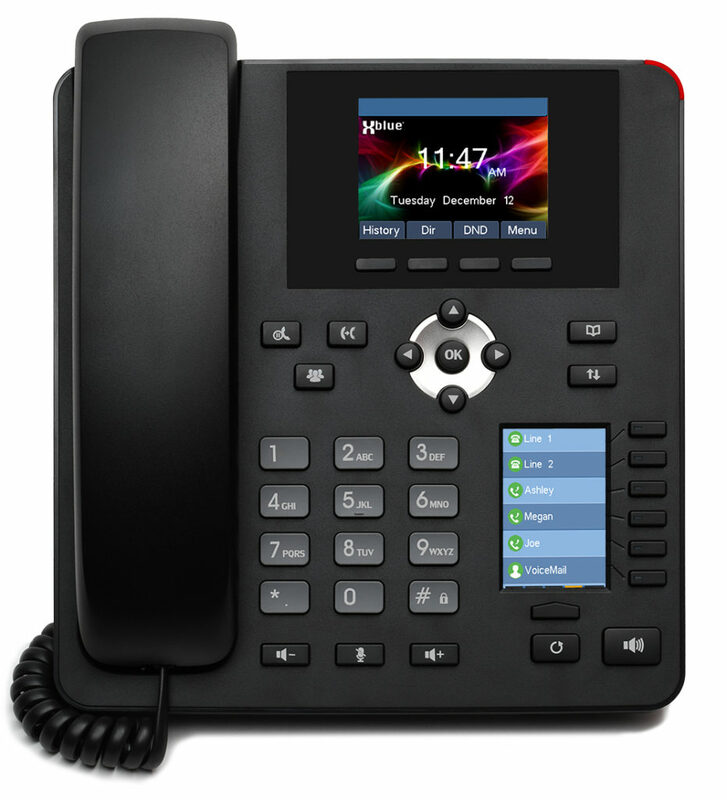 The XBLUE IP7g is a Dual Display, Gigabit, Enterprise-Grade IP Phone. Separate Main & User Programmable Color Displays Improve User Productivity. The Main Display Shows Call Details & Call Logs while the User Display Shows Status of up to 30 System Users in 5 Quick Select Pages. The HD VoIP technology of the IP7g enables clear, high quality audio on every call. The phone’s Dual Port Gigabit Data Switch optimizes data cabling while supporting Gigabit network broadband throughput. Optionally, Cloud Burst supports many standardized SIP 2.0 Endpoints*, including IP-based Cordless and Conference Room phones. What is XBLUE Cloud ? XBLUE cloud services use standardized VoIP technology to connect your business communications to the cloud. Services include XBLUE Telephone Lines and Cloud Burst systems. Both replace conventional or hosted telephone lines that typically are provided by a local telephone company or cable TV company. This enables you to run voice, video and data traffic over the same IP network connection, eliminating the need for separate lines or trunks for each mode, which enables you to make the most of your bandwidth! All Inclusive Features: All Cloud Burst Phone System capabilities are available and ready for use! There are no add-on licensing fees to enable system features. Depending on your level of expertise, some Cloud Burst functions, 3rd party devices & dial tone services may require paid XBLUE Professional Service to assist in setup. We can help you customize your Cloud Burst system specifically for your unique business requirement. Technology: Cloud Burst utilizes VoIP, SIP technology that requires Internet access. The availability of service is dependent on your existing Internet service. Service Location: Service location must be located in the contiguous 48 United States (this excludes locations in Alaska, Hawaii and Canada). One-Year Commitment: Cloud Burst service requires a one-year commitment from date of order. Included Services: One Local Phone Number, Caller ID, Incoming Call Roll Over (Hunting) and automatic Fail-safe Forwarding to a phone number you specify in the event of a network, Internet or power failure. Use of FAX: FAX transmission on this service is limited to documents with up to 5 pages . If larger documents need to be faxed we suggest use of an electronic fax service or a standard analog telephone line.